For the last three or four years I have been using a kind of urban setting board for my Rogue Trader or WH40K2 games. I made these boards looooong time ago (I really mean long ago! ), using just a couple of pieces of plywood and foam (back in those days I didn't even know MDF existed!). Two 120x60 cm (roughly 4x2') compatible boards. State of the art back in the day. No, seriously, the cheapest way of having a board. You may remember scenarios such as Cops & Robbers, The Battle of Benny Hill (formerly 'To catch a thief') or Rebels with a Cause. You have witnessed my efforts to build an atmosphere and a sense of 'warhammeriness'. In fact those boards were built with a broader scope in mind, as I thought I could use them for fantasy settings (or even for a pirete project which I never started) with proper buildings. But after these years of urban warfare I felt I needed something different. Those boards could still give me a lot of fun for years, sure, but the ants in my pants started to ask for a different setting. If you have a look at my Genestealer Cult project you may be aware of my attempts of building a dungeon. Catacombs, mining corridors and so where the Cult hides. Then I came up with the idea of building a small desert town, just the kind of place that could stand over the dungeon. But not an usual board. So, how on Earth am I going to do all this? My early thoughts were oriented towards using the old boards. Could I arrange what I already had and recycle them to get my new vertical board? Long answer: I'll explain with pics. At least you'll see my train of thought. You can see the madness. A board of 120x60x60 cm (roughly 4x2x2'). I'd like to overstock that with adobe houses or whatever. Maybe I could then place another regular, horizontal board to keep expanding the town... Am I going too fast? Well, OK, I'm going too fast. Of course you all have already thought the obvious things. But I had to go through the empirical experimentation to get convinced. First of all, plywood makes an awful material for this purpose, I need to move on MDF. Second, the vertical board cannot be plywood, not only for the bending, but fot the weight. No structure will hold that. So what does all this mean? That I got rid of the boards and the plywood. I needed that space! I said goodbye to my urban boards and started from square 1 again. Winds of change! Here in this context it's where that post about a spaceport fits in. I told you about the inner structure and how I needed to paint it before I built a proper building around it. Here it comes! The spaceport won't be at ground level. Not when I'm thinking of heights! It will be as high as I can place it. The cookie box is 30 cm (1') diameter, so the spaceport will be quite a large building, at least in relative terms. In fact it will be the largest structure of the whole board, considering the volume of the box I'll have to build for it. I made this 50cm high, which is the exact width of the wardrobe I will keep this piece in (I'll show some pics below). The spaceport itself will be on the top. If you look close, you'll see the outer door, it matches the inside one! I got a MDF board, to prevent bending issues. The vertical wall will also be made of foamboard, for weight issues. The space on the wardrobe is slightly more than 50cm, but... I didn't take into account the door. When opening it, it is impossible for the building to fit into the wardrobe. Just a matter of milimeters, but that's enough. To be fair, I'm a legal advisor, you shouldn't have trusted my maths since the beginning. So I had to take a painful decision. I couldn't cut from the upper part, as the spaceport structure is way too complex to be dismembered. I cut 2cm (less than 1 inch) from below. Right, that part where all the reinforcement pieces are. That tornado proof part. That one. So now the whole structure is 48 cm high. It now fits in the wardrobe (checked!) and I can keep on adding stuff. Of course what you see here is nothing but the very basic shape of this bulk. I'll have to add secondary structures and details everywhere. I've been changing my mind about the whole appearance of this like every ten minutes since I started sketching the first concepts, and now that I see it in place... well, I keep on swiftly moving from a solution to another. For example, I always worked with the idea of ascending ramps, just adjacent to the building, so small vehicles could reach the top. But I've suddenly remembered I have this bridge. I need to use it. Here. So the project is really alive, it takes shape as I build it. I have a general idea of the overall aspect I want to achieve, but the details will unfold themselves as the moment comes. By the way, I acknowledge I haven't shown any pic of the spaceport with a ship! This is hugely exciting to me - it is exactly the look and feel of terrain I want to game over. Like you, I am hamstrung by lack of storage space and I will be watching keenly to learn from all your discoveries. Love the spaceport building - it has real presence and a rather nice shape too! Thank you very much, Jon! I have been wandering through several different ideas (including an exclusively vertical board with Ork adobe houses -which is still in my mind! ), but this backwater mining town looked enormously appealing to me. You're real master! Love your work as always! That space port building is great, and a whole board like that will be amazing. Thank you! Haha, sure! I'll have to work on wirings and that exact kind of stuff. I'm not sure if I'll make it all adobe like or I'll make some sci-fi buildings integrated into the structures. Timne will tell! Fantastic! You have a great sense of imagination, and it's always exciting to see where it takes you! Thanks! This part is enormously enjoyable, but if I'm not careful, I'll end up designing a whole town!! Nice! 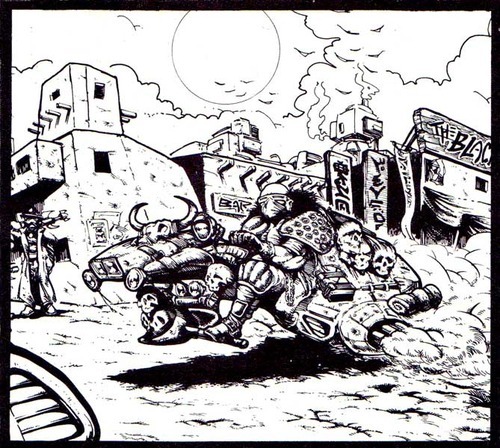 Your general concept was making me think of a Necromunda terrain set that a store around here had back in the 90s. It could be stacked up to form a 4x4x2' block, but for playability purposes, it was taken apart and spread across four 4x4' tables, with marked points where your dudes could move from one level to another. It was kind of a mess logistically, but made for a really cool play experience. Thanks! I have been thinking about that solution for the mine/catacombs/dungeon beneath the town, but I need to make some numbers and plans to see if it is feasible! Great start and I will be very interested to see where this goes. This is madness!!!! (imagine that said by the persian ambassador from 300). You're such an inspiration... And we want more!! And by the way... What are you going to do with all the old stuff, then? That's in fact a good question! I'll try to use some pieces here, but there will be some others I won't be able to recycle for this board. I'll cross that bridge when I get to it! I love how you designed everything to fit your storage constraints. It's a shame that reality didn't match your measurements, but I'm sure that you'll be able to improvise a way to fit everything and make it look like an Ikea piece of furniture from the outside. I love it! Though I find it a bit strange how little you're using from the inside of that huge building. I know, I know, there probably are going to be a lot of gantry ways and such, but I kind of expected a kind of doll house door when I saw your first pictures of the building. I am exited to see where this is going though and curious to see how you're going to keep it all playable without having to resort to ladders to reach everything :D (just kidding). Thank you! Ahh, you touched a nerve. I've been through that conundrum. I made plans for that, but in the end I've decided to save that for other part of the board and focus on the impressive bulk for the spaceport. Precisely if I wanted to keep it playable I had to sacfrifice that huge volume. I'll compensate with smaller buildings on its front and will try the doll house on the next section. Wish me luck! Good luck 😊! I look forward to your next exploits in building the board. Thank you! The basics are easy, the problem is where will this madness take me! I am tracking your progress with an extreme amount of interest! I am back to ship building, and trying to create a 3D environment without having to remove the main deck to fight through the ship. Giving the illusion of playing through but balanced against the build design and having terrain "solid" is a HUGE challenge. Thank you! It means a lot, you are certainly a reference when it comes to large structures. I had to take a compromise solution if I wanted to keep the spaceport; now the challenge is precisely that, to add structures that give the illusion of a 'live' place while keeping it playable. Not easy, but I hope I'll get to somewhere acceptable! This looks brilliant so far. Can't wait to see the finished article. Thank you! Kowloon is an awesome reference material, but it's way too far from my skills! I guess this will be some kind of desert rural hive itself; my plan is to crowd it with catwalks and different levels. Let's see what I'm capable of in the end! It looks like a lot of work. A lot. Really a lot. Me I would just use my imagination if I need it for a tabletop game XD Then of course I don't have an ounce of your creative genius Suber sir! Looking forward to more WIP pictures. me estaba preguntando dónde meterías todo eso? y cuando lo termines cabrá todo en el armario? te está quedando muy bien , me quedo a la espera de las siguientes novedades. Great looking basis for your spaceport city! Good recovery from the door mistake too!